It seems as if the passing of time instead of erasing my memory or decrease my popularity awakens more curiosity and increases the demand for information on my character. The exhibition was a huge success. So much so that it received over one hundred thousand visitors in nine months. More news was waiting. The director of Asian art of Christie’s, London, gets in touch with my biographer. He explains that the inheritor to the House of Kapurthala suggested that he speak to her in relation to the sale of jewels which is going to take place in the month of December of 2007. During said act a bunch of gems that belonged to me were to be auctioned and they need to be formally documented that I was the proprietor of said pieces: two collars, two brooches, two pairs of earrings, one bracelet and my most favourite jewel, the crescent moon shaped emerald. For the catalogue, my biographer lent Christie’s various portraits from the beginning of the 20th century in which I appear wearing said jewels. One of the photographs lent to said auction was an oil painting by E. Patry who made a portrait of me in 1907. 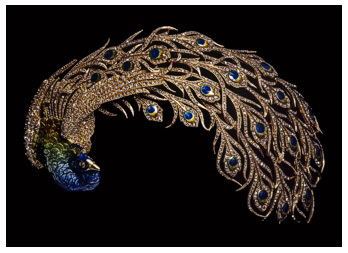 While observing the photograph a responsible of heritage from the Maison Melleiro, Paris, discovered something that I wore on my hair, like a brooch and recognized the peacock shaped brooch with almost two thousand diamonds which Melleiro had crafted in 1905 for my husband. 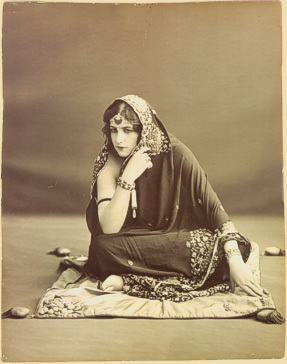 It was the same brooch that the Maharajah wore over his turban the day I saw him for the first time. Think of the faces on the jewellers of last century if they were told that, more than 100 years later somebody was to find in a portrait of me one of the historic pieces which had come out of Melleiro’s workshops!